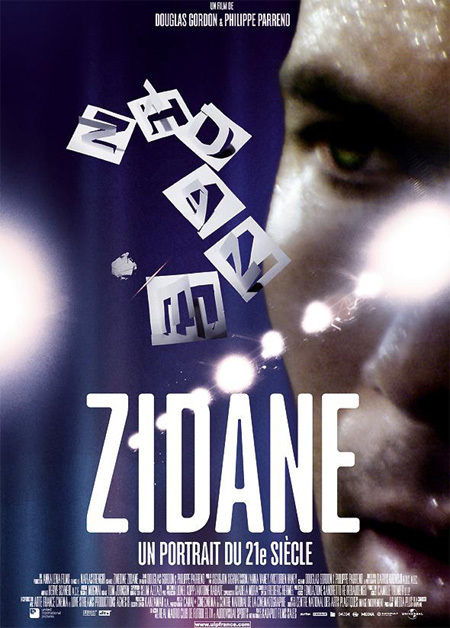 The first time I heard of ‘Zidane: A 21st Century Portrait’ was some time ago. It was in a film magazine (perhaps an issue of ‘American Cinematographer’? ), and the directors of the film, visual artists by the name of Douglas Gordon and Philippe Parreno, discussed the logistical challenges of such an endeavour: 17 cameras recording French football great Zinedine Zidane’s every move in real time. The whole film is played out over a football match against Villarreal in 2005, and the article was an interesting and well-written one; even if I wasn’t a football fan, the unique concept certainly would have been one that attracted me. As it stands, it was an idea that slipped away from me for a while…until recently. I feel obliged to somehow explain further the idea of this particular film, and usually this is where the synopsis of such a film comes in. However, looking back at the above paragraph, I realise that I have pretty much explained all that you really need to know about the concept of the film. But what about the idea behind the concept? ‘Zidane’ was first conceived as an art installation project, something meant to be more at home in the a museum or a gallery rather than, say, GSC Midvalley or Yongsan CGV. Nevertheless, it is a film of some sort, and I am writing about it here for a variety of reasons. The first and probably more obvious one would be the fact that this is something of an essential viewing for many football fans, especially for those who are accustomed to watching matches from the kick off to the final whistle with little to call a break in between. As mentioned earlier, this film covers the entirety of a football match, and the cameras that have their lenses fixed on the French maestro do so in many different ways. There are 17 cameras, so there are practically 17 different types of shots. Some, as it turns out, are not even of him, but are in fact shots of shots of him. Confused? By that I mean shots of the television broadcast of the match (complete with the Spanish commentary) and the camera monitor by the side of the pitch. Unlike your conventional football match, however, we don’t follow the action per se, but Zidane’s own acts throughout the whole film. If he has the ball, he runs with it, does a little flick, passes it on. Once in a while, the likes of Beckham or Raul would flash past the screen. Francisco Pavon, a defender who is forever immortalised by ruling definition of the Galactico policy (a team of Zidanes and Pavones), concedes a penalty, and you’ll see the disappointment on his face, up close and personal, warts and all. Predators: not just an unmanned Amercan flying killing machine. What is also fascinating is what he does off the ball. It’s the little things he does that truly grabbed my attention. For example, he has a tendency of digging his front studs slightly into the ground every once in a while, almost as if he’s testing to make sure that, yup, this is not a dream, it’s real life. It’s an aspect of his game that I have not seen before, despite having spent over ten years following his career. It is in such moments that I wondered what we have been missing all this while, having been conditioned to witness football the way we have. It makes me realise that the number of angles we have are limited, and our choices are more or less at the hands of the broadcast director. Furthermore, the camera follows the ball, not the players, and so we ourselves miss out on all the little idiosyncrasies that every footballer has. Imagine, for a moment, if such a project had featured Paolo Maldini: what would the great defender be up to when the ball is on the other side of the pitch? What would a goalkeeper like Edwin van der Sar do in his idle moments? (I know that Jens Lehmann would just be taking the piss). Another question that popped into my mind stemmed from Zidane knowing he was being recorded. How much did that knowledge affect his decisions on the field? Could such idiosyncrasies, then, be a mere play for the cameras? A part of me thinks that it is a factor, but another side of me argues that he performs week in, week out in front of thousands and thousands of people; perhaps he doesn’t really care all that much. I’ll let you decide that. Another fascinating feature of this film is the use of sound. The sound design here is absolutely superb. It was artfully edited, and you do get a huge amount of interplay between the different angles and sounds. Once in a while, the filmmakers would fade out the sound, so much so that all you can hear is his breath. You’d hear every step, every kick, even the words he utters under his breath to the referee. It made me think, then, of what language a player would speak to the referee during matches. What would Cannavaro be saying to a referee during a World Cup match? Does the referee understand all the commotion by the players when they surround him, after he had given a decision against them? All this was set to the dreamy melodies by Scottish band Mogwai. "The ball is Materazzi's head, the ball is Materazzi's head..."
Equally priceless is the subtitles that would run across the scene from the match. It’s not actually a translation of what goes on on-screen…not directly, anyway. It’s an excerpt from an interview with Zidane. You’d see him strutting about the pitch, and then you’d also read that when he was younger, he’d have a running commentary in his head whilst playing football. “It wasn’t really my own voice, it was the voice of Pierre Cangioni, a television anchor from the 1970s,” it’d read. “It wasn’t that his words were so important, but the tone, the accent, the atmosphere, was everything…” It reminded me of the pro wrestler Mick Foley, who wrestles most of his matches with Jim Ross’s running commentary in his head. Does Wayne Rooney buzz around the football pitch to the sweet sounds of John Motson? The half time break would also be accompanied with similar words, but describing the events that took place during the day and date of the match itself, with the appropriate images: “Hundreds of homes are destroyed in Serbia Montenegro during the words floods in forty years. Elian Gonzalez speaks on Cuban national TV. The spaceship Voyager records plasmawave sounds.” And so on. Note that it’s written in the present tense, almost as if to say that as the match is going on, all these events are happening. As such, this project, I think, aims not only to capture Zidane on camera, but singular moments that makes up the whole. Apparently, there was a similar project in the 70s that tried to immortalise George Best in a similar way. After having seen ‘Zidane’, I am incredibly keen to see what that project was like. This one aimed to capture momentous events of life, death, victory and defeat on the day of April 23rd, 2005; there is an attempt to change how we see a football player and a football match, as well as an attempt to go beyond the football match itself by highlighting the other things that happened on the same day and date. A project that made me reconsider the way I watch a football match and revise my opinions about a player who I spent a decade watching. Definitely didn’t think I’d be writing that before I watched this. The cynical side of Fikri thinks that any projects involving Michael Owen would probably be end up as a short film.